Enjoy Peru’s most important destinations, exploring and discovering spectacular views on foot, biking or paddling. Remember, all our trips are customized, and your itinerary will be adjusted according to your schedule and interests. All our services are carefully selected to make your trip an unforgettable experience. Day 1: Arrival in Lima. Day 2: Lima | a.m. Swim with sea lions, p.m. Larco Museum for kids. Day 3: Sacred Valley | a.m. Feed alpacas, p.m. Ride Peruvian Paso horses. Day 4: Sacred Valley | a.m. Bike riding to Moray, p.m. Visit Maras salt mines, and a walk along the Pichingoto route. Day 5: Machu Picchu | a.m. Short Inca Trail, p.m. Walk the ancient city of Machu Picchu. Day 6: Machu Picchu | a.m. Hike to Machu Picchu Mountain, p.m. Return to Sacred Valley. Day 7: Sacred Valley | a.m. Stand-up paddle, Cusco | p.m. Andean musical instruments workshop. Day 8: Cusco | a.m. Inca stone slides, p.m. Return home. Be closer to the sky than ever before! 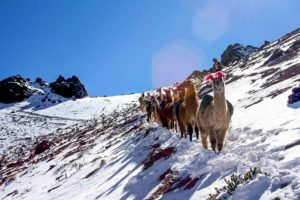 Feel the energy of the Andes on a hike that will take you to our high-Andean shepherds communities, where farming is impossible, and only llama and alpaca breeding allows for good livelihood. Home of the Apus, spirits of the mountains, who protect and care for their children. To enjoy the full experience we recommend a 5-day, 4-night extension, not including transportation time to the area. Be amazed by the beauty of life in the heart of the Peruvian Amazon. 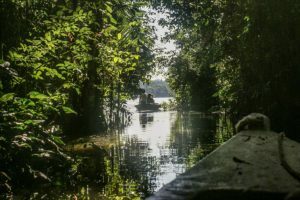 Experience magnificent landscapes and rich wildlife and flora, in one of the most biodiverse regions of the planet, while hiking paths and boating on lakes in our lush virgin rainforests. To enjoy the full experience, we recommend a 4-day, 3-night extension, not including transportation to the area. Travel to where the Incas originated, the cradle of creation myths of the great empire. Lake Titicaca and its beautiful floating reed islands are home to native populations that through the ages have maintained a unique and admirable lifestyle. To fully enjoy the entire experience we recommend a 4-day, 3-night extension. 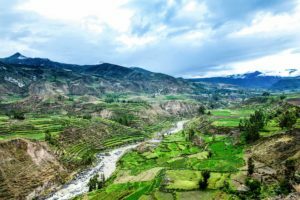 The Colca Canyon, 3,200 meters deep, is one of the most spectacular landscapes in all Peru, where you’ll experience watching the majestic flight of the condor, visit villages remarkable for their rich cultural traditions, along with admiring the impressive beauty of Inca stone terraces. To live the entire experience, we recommend a 3-day, 2-night extension, not including transportation to the site. The Nazca Lines, an enigma in the desert. 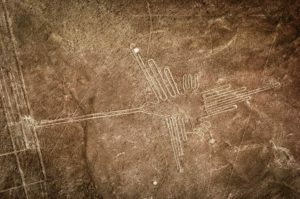 Explore the enigmatic Nazca Lines, the mystery of hundreds of figures and symbols etched on the desert floor, that tell a story yet to be deciphered. Get to know the legacy of an ancient people who possesed an impressive knowledge of astronomy and mathematics. Continue on to coastal islands where you’ll enjoy observing the diverse marine fauna of Peru’s coast. To enjoy the full experience, we recommend a 3-day, 2-night extension, not including transportation to the location. Peru’s North Coast is one of the most amazing landscapes on earth, where the desert comes alive and transitions to forest. 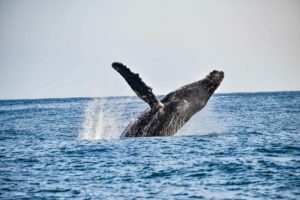 This is the location of an unforgettable spectacle: the humpback whale migration, when the whales arrive from Antarctica. Swim with sea turtles and enjoy the sunny, always warm beaches. To enjoy the full experience we recommend a 3-day, 2-night extension, not including transportation to the area. 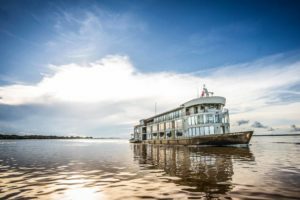 If you’re wishing for a wonderful experience in the jungle, traveling in luxurious and comfortable style, a cruise along the Amazon should be just right for you. Enjoy the wildlife, lush forests, cultures and local cuisine as you navigate along the world’s largest river, in the comfort of an “all-inclusive” cruise. For the full experience, we recommend a 4-day, 3-night extension, not including travel to the region. All organizing and arrangements for a customized trip. Private vehicle for all tours. Accommodations as described in the full itinerary. Train tickets according to services described in the full itinerary. Entrance tickets to Machu Picchu. Roundtrip bus tickets to and from Machu Picchu. Entrance tickets to all visited sites, unless explicitly indicated. Lunch on every day of the trip. Some dinners, as indicated in the full itinerary. “I traveled with my family: my wife and daughters (ages 23, 18 and 16). I’m almost 60 and my wife wanted to spend her 50th birthday there, at 5,100 meters altitude. Those 10 unforgettable days changed us all in positive ways. I have many stories to tell, but believe me that few experiences in life (such as this) can make one feel so alive, while allowing us to appreciate such beauty, mystery and grandeur”. Our company’s top priority is to guarantee the best possible travel experience for you and your accompanying travelers. With that goal in mind, we have developed the most flexible and accessible terms and conditions on the market to ensure that you will enjoy an unforgettable trip. AUQUI MOUNTAIN SPIRIT E.I.R.L. 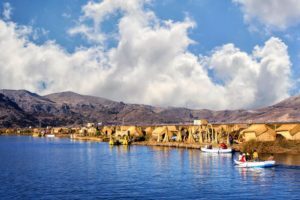 (designated in this document as “AUQUI”, “we”, “us”, or “the company”) is a company based in Cusco, Peru that specializes in offering top-quality tourism services. By means of this document, we establish existent, legally binding contractual relationships with our clients (cited here as the “client” or “clients”, “travelers”, “passengers”, “you”, “he/she” and/or “guests”), understood here as the parties who by different means have accepted and closed contracts for trips and services with AUQUI, or who solicit or contract with the company for our trips and services. The trips and services contracted for with AUQUI by the client are designated in this document as: the “trip” or “trips”, “services”, the “itinerary”, the “program”, and/or “the experience”. Contracts with the company for trips and/or services will be validated by the clients’ acceptance of all terms and conditions indicated in this document, and by completion of the initial payment, which also presupposes the approval of the proposed final itinerary. Only at the exact moment of contract closure can AUQUI assure the reservation of the services proposed in the itinerary. WHO RETAINS THE RIGHTS TO EXECUTE THE TRIP TERMS AND CONDITIONS? Both AUQUI and the contracting client or traveler (the person or party who contacts the company and who pays for the contracted services) are the only authorized parties who can execute or carry out the terms and conditions of a trip, as indicated in this document. According to the terms and conditions subsequently established here, both the client and AUQUI are the only parties authorized to make any changes, cancelations, and/or other processes related to the contracted services. The contracting traveler can authorize another person or party to execute the trip terms and conditions, as well as to carry out trip changes or modifications on the traveler’s behalf, only by expressly requesting and authorizing such changes by means of an electronic mail message to the company, which must also be explicitly approved by AUQUI by means of an email message in response to the client. AUQUI creates custom trip experiences that are designed according to our clients’ interests, by offering suggestions that are focused on fully satisfying all our clients’ expectations. We dedicate a great deal of time to getting to know our clients and to understanding their requirements and wishes, in order to propose, design, operate and contract for services that are fully in accordance with our clients’ requirements and wishes. The services that AUQUI offers include: trip design and planning of customized itineraries to different destinations in Peru, as well as organizing detailed itineraries for tourism activities and entertainment, such as guided tours, adventure sports, hikes, family-focused activities, and dining, among others. Additionally, the company makes reservations for services on behalf of our clients, whose service use rights are then ceded to the client. Details of the services operated and contracted by AUQUI are indicated in the itinerary. Services sub-contracted by AUQUI to third-party providers are not directly under our control, and do not imply joint responsibility, since third-party providers are responsible for providing their own services, and AUQUI has no direct involvement in third-party operations. In this document and elsewhere, we refer to “third-party providers”, “third-party service providers” and/or “third-party services” as to include a variety of companies and services that AUQUI contracts with in order to implement and operate itineraries that have been approved and contracted for by clients; these companies represent mainly hotels, but are not limited to such. AUQUI’S experience in the tourism market guarantees the highest quality, efficiency and security in planning and operating our services, and the best choices of third-party providers, in accordance with our high standards of quality. Protecting our clients’ privacy is extremely important to us. AUQUI guarantees that the personal information provided to us by our travelers (including: identification documents; bank account numbers; credit card numbers; email addresses; information about personal choices, interests, preferences, etc.) will not be used or shared for any purpose other than to provide the services that we have offered, and that clients’ contact information will only be used or shared for the purpose of such services as have been contracted. In accordance with the contracted services, we will solicit the necessary information for the planning of the trip, which includes: flight reservations, hotels, or any other requested or required services. Said information will be subject to sharing with third-party providers, only and exclusively for the specific purpose of contacting services that allow us to plan and operate the itinerary. Written approval of the final itinerary on the part of the client and the completion of the initial payment are understood to be the client’s authorization for AUQUI to make use of the relevant information for the purpose of planning and organizing of the trip. We recommend reviewing our Declaration of Privacy and Security for further details. AUQUI will protect and safeguard all of our clients’ information, eliminating any sensitive information from our records once it has been used for its intended purposes. The necessary documentation for entering Peru can vary, depending on the traveler’s nationality. In general, a valid passport is required (if the traveler has a South American country’s nationality, only an identity card is necessary). Even so, travelers will need to consult with the immigrations offices and the consulates of their respective countries in order to be informed of any other prerequisites and restrictions that might apply. It is the traveler’s responsibility to ensure that their passport, as well as any other required document, remains valid during their entire stay in Peru. Minors of less than 18 years of age can only travel when accompanied by an adult, parent, guardian or relative who is carrying the appropriate documentation, such as legal travel authorizations for minors, among other required documents. AUQUI does not accept responsibility for any trip modifications or cancelations due to any client’s disregard or non-compliance with the conditions related to documentation requirements, as indicated here. IMPORTANT: Most entrance tickets for the destinations we offer require valid passport numbers and are issued according to the person’s name. In the event that a client has changed or been issued a new passport prior to the trip, said client will be required to provide the new passport number to our sales agents. Otherwise, problems could be encountered at the time of entry into the country. Any changes of passport numbers for previously purchased tickets require extra charges, of which the client shall be promptly informed. We recommend that you travel with a passport that will remain valid for a period of 6 months following the completion of the trip. It is each traveler’s responsibility to evaluate their own physical condition prior to travel, in order to carry out the activities contracted for in the itinerary and without experiencing any health risks or complications, and considering also the geographic and climate conditions of the chosen destinations, some of which are located at above 9,800 ft. (3,000 m.) above sea level. We recommend that our clients have a general medical check-up, update their vaccinations, and take all necessary precautions according to their medical history and to their primary care physician’s suggestions. Travelers with existing medical conditions must consult with their physician prior to the trip, and must promptly inform AUQUI regarding any prior medical conditions or special health needs they might have, in order to take all necessary precautions. It is the traveler’s responsibility to declare any illness, disability, special physical condition, or treatment for any medical or physical condition that he/she has or is undergoing at the time of the trip or recently prior, and to declare the same information about their accompanying travelers. Likewise, it is the client’s responsibility to make proper arrangements for the provision of medicines or treatments that could be necessary during the trip. Omission of any such information is a violation of the Terms and Conditions, as indicated in this document, which could result in cancellation of the trip without the client’s right to reimbursement of any payments completed. AUQUI does not accept responsibility for any consequence incurred due to any medical information not provided to the company by the client prior to the trip, regarding any current or recent medical and/or health condition, or physical or mental disabilities. Travelers of over 60 years of age are required to consult with their primary care physician regarding their physical preparedness for the trip. With completion of the initial payment, all clients accept the requirement of being inadequate health condition in order to travel, both in the case of the contracting client, as well as all accompanying travelers. AUQUI reserves the right to cancel contracted services if the company considers that the client is not in the necessary or appropriate physical condition to be able to carry out the trip in a manner that ensures their proper health and wellbeing, and/or in the event of negligent or high risk behavior on the part of the client at any time during the trip. AUQUI is committed to safeguarding your health and personal wellbeing by proving close attention to your health, physical integrity and satisfaction. AUQUI upholds all insurance requirements, as required by Peruvian Law. However, for the traveler, having an appropriate personal travel insurance policy is very important. Thus, it is necessary to consider that some insurance companies do not cover risks that may occur at altitudes higher than 9,800 ft. (3,000 m.) above sea level. It is the responsibility of the traveler to contract for their own travel insurance policy, and to know and understand all the details of its coverage. We suggest purchasing an insurance policy that covers events such as: trip cancellations, shortened trip time, emergency evacuation costs and/or medical costs, costs of returning to the home country, damages, robbery, and/or loss of personal baggage, money and/or goods. As a preventive measure, we thank travelers who provide us with their insurance information, with the purpose of facilitating their paperwork in case of any such contingency. AUQUI, its representatives, partners and other parties related to the company are do not accept responsibility for any costs incurred, or losses caused or suffered by the traveler and/or by dependent travelers or accompanying travelers, due to unexpectedly caused natural events, blockage or closing of roads or other transportation corridors, or other events that are unrelated to the operations and management of the services we offer. It is exclusively the responsibility of the traveler to contract for emergency trip insurance, in consideration of potential events, as described in the previous paragraph. AUQUI provides our travelers with the best possible conditions for enjoying their trip, including all available security measures to guarantee their protection and wellbeing. Our services cannot be directly contracted by minors, who can only travel accompanied by their parents or legal guardians, or by family members who have obtained proper legal authorization. Clients who have physical disabilities, who are specially-enabled, or who have needs for special assistance must inform the company prior to travel to indicate the nature of their disabilities or special conditions, in order to take all necessary precautions, and to evaluate whether proper or sufficient accessibility conditions exist for AUQUI to provide the services it offers. In the event that such information is not provided promptly to the company by the time of contract closure, the company reserves the right to carry out trip cancellation. Expectant or pregnant mothers will be able to travel with previous authorization by their primary care doctor if and when the pregnancy is at less than 24 weeks, or 6 months. The AUQUI team takes into account all necessary preventative measures in order to avoid existent or future risks during the trip. However, AUQUI does not accept responsibility for: any action, event or omission which is not under our direct control (which can include, but is not limited to: random events, unavoidable events, unexpected natural events (or Acts of God), inescapable fears, failure of third parties in meeting their commitments, societal and/or political situations, flight delays or cancellations, and other circumstances that are not under our direct control), and which could change or alter the program and/or generate additional costs. It is important to highlight that flight tickets and train tickets are at times subject to overbooking, cancellations and/or schedule changes. If any such circumstances were to occur, we will lend assistance in every way possible and necessary. AUQUI does not accept responsibility for additional charges to the client due to delays, cancellations and/or other changes generated by the third-party or direct service providers. Likewise, our company reserves the right to carry out any change it considers prudent during trip operations, in order to improve the experience, or to safeguard the safety and physical wellbeing of the passengers. AUQUI is always a step ahead of events during the trip, in order to make certain that you will enjoy a safe and tranquil experience throughout the trip. AUQUI upholds all insurance requirements, in accordance with Peruvian Regulations on Tourism and Travel Agencies. However, it is important to emphasize that one or more types of activities that the traveler might take part in could bring about or result in different degrees of risk. Due to this possibility, and by obligation, the traveler shall sign a document of Waiver of Liability and Assumptions of Risk. By accepting the Terms and Conditions, and by signing the Waiver of Liability and Assumptions of Risk, the client assumes complete responsibility for his/her participation and that of his/her accompanying travelers in all activities contained in their trip itinerary, and for all trip activities carried out or completed by the client and accompanying travelers, including any by minors under his/her legally authorized charge and/or guardianship. Likewise, by signing the Waiver of Liability and Assumptions of Risk, the client declares to have received sufficient information regarding the levels and potential conditions of risk related to the trip activities, and about precautions necessary for carrying out the activities in a safe manner, and thus waives AUQUI from any type of civil, contractual or extra-contractual liability or responsibility that could ensue due to the client’s and/or their accompanying traveler’s negligent actions, or through any lack of adherence or disregard on part of the client and/or their trip companions of the Terms and Conditions established and published in this document. We thank our clients for understanding that however much care is given to itinerary planning, operations and prevention of contingencies, in providing our services unexpected incidents or circumstances can occur, ranging from minor situations such as delays, to accidents of a different nature. If the client directly contracts with other providers who are external to the operations of our company for other activities than those described in the AUQUI itinerary, AUQUI does not accept liability and/or responsibility for any results obtained by carrying out activities related to said external contracts. AUQUI reserves the right to reject as a trip participant any person or party who the company considers to be not capable of meeting the rigors and physical requisites needed to participate in the trip; as well as any person who commits unlawful actions or violates laws and/or regulations; any traveler who endangers their own personal security and/or that of other travelers; and any traveler who engages in behaviors considered to be socially unacceptable, objectionable or offensive. By signing this document, the client accepts his/her willingness to follow all security regulations, presented either in writing or conveyed verbally by AUQUI’s representatives. AUQUI reserves the right to carry out modifications of trips, routes, hotels, and security arrangements, with the purpose of improving the quality of the trip, and to ensure the comfort, safety and wellbeing of the guests, and/or in response to unexpected circumstances or events. AUQUI commits to minimizing any and all risks inherent to the activities that our clients will experience during their trip, by anticipating contingencies and by providing adequate safety and security protection measures. 8.2.1 Upon contacting for our services, AUQUI does not accept liability or responsibility, and will not be held liable, for any costs and/or losses due to unexpected, chance or random events, Acts of God, unavoidable and/or unforeseen natural events, blockages or interruptions of transportation routes, and/or other events that are not directly related to the operations and management of the services that the company provides, and/or under the company’s direct control. Physical efforts or exertion for which the traveler is unprepared. Natural disasters, environmental phenomena, or events of nature. Collisions with bicycles, pedestrians or motorized vehicles. Deficiencies or deterioration of highways or roads, which may include (but are not limited to): highways affected by weather or climate situations, or by societal events or circumstances, Flights, train trips, motorized vehicle trips, boat trips, and/or other modes of active transport or adventure. Consumption of alcohol, and/or illegal drugs and/or or mind-altering substances on the part of travelers, or of other involved third parties unrelated to AUQUI. Civil unrest or social disturbances. Geographic altitude, climate conditions, or illnesses endemic to the locations included in the contracted itinerary. For a lack of, or limited access to medical attention in remote locations, and for the quality of provided medical attention; and if it were the case, for health services provided by health personnel not associated to AUQUI’s operations. Additionally, for any emergency first-aid performed by AUQUI personnel or others for the purpose of safeguarding the health or saving the life of the client, prior to the arrival of qualified medical personnel. AUQUI is committed to assisting you diligently in the case of any unexpected circumstance that might present itself, in order to promptly resolve the inconvenience or problem. 8.2.2 If a client decides to participate in any activity that includes or involves among the following activities (but not limited to these): excursions with animals, underwater diving, snorkeling, rides in hot-air balloons, zip lines, high-altitude hiking, climbing, rafting, and/or any activity that AUQUI considers as potentially involving an inherent or likely risk of bodily injury, or risk of contracting an illness, or a risk or danger of death, the client must in such cases sign the Waiver of Liability and Assumptions of Risk, by which it is mutually understood that the client and all trip companions who participate in any such activity do fully recognize, comprehend, and assume personal responsibility for their own health and security, and for any injury, illness or death that might occur while carrying out said activities, and thus the clients commit to complying with all safety and security measures that are required by AUQUI and by any third-party providers. AUQUI is committed to providing and ensuring the best security measures possible, and to contracting providers who uphold the highest possible standards of safety and quality. 8.2.3 The client accepts that the Trip Terms and Conditions represent a binding, executable contract, which applies to all family members and minors under the client’s guardianship; as well as to heirs, descendants, concessionaires and representatives of the client, and to all other trip participants. The client, upon contracting for AUQUI’s services, and as ratified by the initial trip payment, accepts by their own free will the terms related to the Waiver of Liability and Assumptions of Risk, and to all other terms and conditions designated in this document. At the same time, the client accepts that, upon cancellation of any single part or activity of the services agreed upon in the trip itinerary or in the trip contract, the remaining elements therein will remain extant and in effect. No additions, rescissions or changes shall be made in regards to the Waiver of Liability and Assumptions of Risk. AUQUI assumes no responsibility for providing medical attention to its clients as part of the services contracted. The client authorizes AUQUI to obtain medical attention on behalf of the client in the event of any situation that would require such assistance. Additionally, the client waives AUQUI of any liability or responsibility derived from any medical attention that has been provided in the company’s name, and/or from transportation of any client to a medical facility. Additionally, the client accepts to pay any and all costs associated with any medical attention and/or transportation of any client to a medical facility, as related to emergency medical situations during the trip. Additionally, AUQUI does not offer health, medical or disability insurance as part of the services contracted for by the client. We recommend that clients obtain insurance for medical services or health insurance that offers full coverage during the time and duration of the trip. In the event of complaints or claims concerning services operated by AUQUI, it is the client’s responsibility to immediately inform the company of the events involved in a complete and detailed manner. In the event that the client neglects to inform the company in a timely fashion, AUQUI will not be able to provide effective solutions for said inconveniences or problems, their consequences, or the dissatisfaction generated thereby. In Peru, the platform utilized for registering claims or complaints is the Claims Book (Libro de Reclamaciones), which can either be requested from our offices, or filled out online at our website. AUQUI is committed to promptly, efficiently and effectively resolving any claim or complaint you might have regarding our company’s services, in seeking to assure your full satisfaction and tranquility. AUQUI accepts no liability or responsibility for the loss of any personal belongings, such as passports, tickets or other documents, nor for losses or damage to personal baggage, goods, or other passenger belongings which not been properly declared to the company and placed under the proper care of our company’s personnel. Nor does AUQUI accept liability or responsibility for losses of any personal belongings that have been placed in the care of third-party providers. AUQUI is committed to taking great care in protecting your personal belongings, so that you will be assured of the security and safekeeping of all articles and personal belongings that you place under our care. Even though AUQUI does everything possible to guarantee the accuracy of its publications, typographical errors can occur in print or in the information provided (including prices) that could be transmitted by different communications media utilized, including information transmitted by company personnel to clients. Therefore, only the final program and final itinerary provided to the client has definite total validity. We thank our clients for their understanding of any possible errors they might encounter at the moment of receiving information regarding the company’s services. AUQUI is committed to ensuring that all published company information is as clear, informative and accurate as possible. Responding in timely manner to all inquiries, doubts or requirements of our clients during the trip design phase. Operating and/or implementing the itinerary and activities approved by the client. Guaranteeing the highest quality in all the equipment utilized, services rendered and contracted third-party providers. Assuring the assistance of highly-qualified personnel. Offering all necessary security measures to guarantee the physical wellbeing and safety of our clients. Responding promptly to any incidents or situations that may present themselves immediately prior, during the trip, or immediately following, whether it be AUQUI’s direct responsibility or not. AUQUI is committed to working proactively, and with full diligence and dedication, to create an exceptional trip experience for you; one that surpasses all your expectations, from our first contact, until the return home. AUQUI only accepts responsibility for clients’ claims or complaints in the event that negligence on the part of the company can be demonstrated. This applies to all cases or circumstances mentioned above, from loss of baggage to situations of risk, and without this clause superseding the points previously outlined here. AUQUI is committed to doing everything possible under our control, and more, in order to ensure that your trip experience is extraordinarily positive, and does not present any inconveniences. In accordance with domestic flight fares and conditions set by airlines, clients have the right to bring on their trip a certain quantity of baggage within airlines’ baggage size and weight limitations, about which they will be promptly informed of. Any overweight or excess baggage surcharge or fee implies additional costs that must be paid by the client. AUQUI accepts no responsibility or liability for excess or overweight baggage charges. IMPORTANT: We thank our clients for considering possible excess weight of goods purchased during their visit. AUQUI accepts no responsibility or liability for excess baggage weight under said circumstances. Several trip activities exist that may limit baggage size and weight, both during the activity but not limited to it, such as: train travel, hikes, boat travel, etc. AUQUI will promptly inform our travelers any restrictions regarding weight, size, volume and or others, as included with provided information related to the activity. AUQUI accepts no responsibility or liability for inconveniences, costs or other issues due to disregard of such policies, whether those be our own, or of third parties. AUQUI is committed to trying to finding ways to efficiently resolve inconveniences related to excess baggage that you might encounter, if and when a solution can be found, and to try to avoid our clients any such inconveniences. Prices quoted by the company for programs are considered per person, and based on double occupancy, unless otherwise indicated. Although not normally expected, published prices could be modified due to significant unforeseen and unexpected external factors. IMPORTANT: AUQUI does not accept any obligation to provide any breakdown of costs for any trip program offered. AUQUI is committed to being flexible, according to the requirements that our clients might have. A minimum prior deposit of 30% of total trip costs, according to the timetable set by the client’s sales agent. Said timetable of payments is established according to the payment policies of the providers involved in the itinerary, with the most time-sensitive being air fares, hotels, entry tickets, among others. Only with the completion of this initial payment can AUQUI guarantee the implementation of the services indicated in the itinerary. The balance of remaining charges (70%) must be paid at the latest seventy (70) days before the starting day of the trip, unless a previous written agreement exists that indicates otherwise. In the case that the starting day of the trip is less than or equal to 70 days, payment policies will differ and will be communicated promptly to our clients. The client can make minor changes in the itinerary, according to the policies described here. The company will make the best possible effort to adapt to the client’s requests. However, important changes that imply cost surcharges, such as destination city, hotels, flights, train fares, etc. will result in additional, non-refundable charges. AUQUI reserves the right to modify its payment policies, if circumstances require this. AUQUI is committed to being flexible, according to our clients’ needs. AUQUI facilitates payment for services by means of an online payment platform that accepts all major credit cards. AUQUI does not handle or store clients’ credit card information. In the case of the client selecting payment for services by means of a credit card, the client then agrees to accept all payment conditions indicated by the payment platform. Due to anti-fraud regulations, any payment larger than $5,000 U.S. dollars must be accompanied by a photographic or scanned image of the credit card with which the payment was made (only of the front of the card on which the credit card number is printed), along with an image of the cardholder’s passport’s main page, or of his/her identity document. This information will be sent by the service provider of the payment platform to the credit card’s offices, to be compared with the emitting bank in order to verify the authenticity of the payment. Once payment has taken place, AUQUI will delete any information related to the documents mentioned previously. IMPORTANT: It is the responsibility of the client who makes a payment using a credit card to call their bank prior to payment to activate international payments, indicating that a payment shall take place in Peru, and to activate the payment of larger funds, indicating the approximate amount of the payment. Most declined payments are due to disregard of those two factors. AUQUI is committed to ensuring that the payment platform we offer is safe and secure, and that all sensitive information shared by the client in making a payment is deleted once it has served its intended purpose. The final priced agreed upon by the client and the company references the final itinerary approved by the client, and only includes all services explicitly indicated in the final itinerary. Any services contracted for by the client, prior, during or following his/her trip that is not indicated in the final itinerary, as well as unavoidable situations for which AUQUI is not responsible (including, but not limited to: flight changes, currency devaluations, delays; among others) will imply extra charges, which will be promptly communicated to the client. AUQUI is committed to safeguarding your interests by minimizing any extra charges. Our payment policies apply to services offered by AUQUI. In discussing special services, we refer to such services which, due to their high demand require anticipated purchase and payment. Such services include entry tickets (particularly for the Inca Trail and Machu Picchu), transportation tickets for any mode of travel, and hotel reservations, among others, regarding which the client will be promptly informed. Most third-party provided services are subject to payment, cancellation and reimbursement policies different to those of our company. In such cases, payments, cancellations and reimbursements will be adapted to the policies of each provider, about which our clients will be previously informed. We understand that clients may choose to cancel their trip due to unexpected circumstances. For us, what is most important is to offer you the most flexibility possible to ensure that you will have the best experience. In the event that the client expresses in writing a desire or need to cancel the trip (and regardless of the time at which the cancellation email has been sent), AUQUI commits to refunding the total amount invested by the client, except for any expenses incurred via bank transfers, as well as all costs which, due to third-party providers’ policies, cannot be refunded (such policies may differ depending on each provider, and with hotels, Machu Picchu entrance tickets, airfares, among others, as being the most susceptible to non-refundable charges). It is essential to consider that, generally, hotels charge 100% of cost for cancellations made less than 30 days prior to the arrival date. Likewise, other providers may have their own cancellation policies. AUQUI reserves the right to cancel the trip in the presence of external factors that could put at risk the security and safety of our clients. In such cases, AUQUI will reimburse the entire amount invested by the client, except for charges by third-party providers due to their own policies and fund transfer costs. AUQUI will not assume or accept responsibility for extra costs or personal costs related to trip cancellation. In the event of a trip cancellation, the clients will promptly be informed. AUQUI will not accept any responsibility or liability for any inconvenience caused or generated by a client due to trip cancellation. AUQUI is committed to reimbursing our clients the highest amount possible. Depending on the time of cancellation of a trip activity or service, in the case of third-party providers, cancellation fees or penalties will be applied that could amount to 100%. For cancellations made within 72 hours of the beginning of the service or activity, the penalty is most likely to be 100%, depending on the provider’s policies. AUQUI is committed to do everything possible to cancel the activity or services, if you require it, and recover as much as possible of your investment. In the case that the client directly expresses his/her wish to postpone the trip, and with reimbursement of charges, the client must request this by means of an e-mail message to the company. Regardless of the time at which the postponement message was sent, AUQUI commits to reimbursing the total amount invested by the client, except for all costs that are non-refundable due to third-party providers’ policies, and/or charges incurred through bank fund transfers. It is essential to consider that, in general, hotels charge 100% of costs for cancellations made 30 days prior to the arrival date. Other providers may have their own cancellation policies. In the case that the client expresses their desire to postpone the trip without reimbursement, but applying the amount paid as credit toward a new future trip date, such a request must be made in writing via an e-mail to the company. In such an event, AUQUI will do everything possible to confirm the same services for newly selected dates. However, it is possible that availability may vary, which could imply extra costs or penalty charges for changes of dates. Such information will be provided to the client promptly in order that the client assumes the corresponding charges. AUQUI will do everything possible to avoid any extra charges due to trip postponement. Any changes in the itinerary that the client requests prior to contact closure (contract closure is considered, following approval by the client via email, the moment that the initial payment has been completed), changes be made free of charges, and according to the availability of services that were subject to change, with any variation in the cost of third-party providers to be covered by the client. In the event that the client requests changes after the itinerary has been contracted, such changes will be subject to third-party providers’ policies and to the availability of said services, due to which extra costs may be incurred, about which the client will be promptly informed. Under such circumstances, AUQUI then reserves the right to make the changes it considers pertinent to the itinerary, without disadvantaging the client, while respecting and maintaining the contracted services or the equivalent of these, only if and when such unexpected events do not imply the total loss of the contracted services. The client will be promptly informed in the event of any such changes. AUQUI takes responsibility for doing everything within our capacity to make the changes requested by our clients, avoiding additional costs when and to the extent that this is possible. At AUQUI we are happy to be able to offer you options in the event that a traveler in the group cannot join the trip, and the client informs the company of such a circumstance in writing, and in order to substitute said traveler by another guest who meets the required conditions to take part in the trip. It is important to consider that said change could imply additional costs from third-party providers, as well as changes in the availability of specific services. AUQUI is committed to doing everything possible to reduce costs and expedite the requested changes. AUQUI does not guarantee the accuracy of the information provided by third-party providers (hotels, restaurants, among others) by means of brochures, emails, websites or any other communications media. Any information or image published by AUQUI is a reference, and the opinions or testimonials of our clients may or may not reflect the individual perception of other persons about a specific service or activity; due to which any dissatisfaction regarding a difference between said information and the client’s perception of said service or activity does not constitute grounds for a claim, reimbursement or responsibility on the part of the company. AUQUI is committed to ensuring the quality and accuracy of the information we provide. International flights are not included in the price of the program. The programs offered by AUQUI require domestic flights in Peru, as specified in the itinerary. Domestic flights are not included in the sample programs, and will be included explicitly and with approval of the client. In the case of charter flights, seating is limited and AUQUI reserves the right to substitute and confirm reservations on an appropriate alternative flight. All domestic or in-country flights are based on non-refundable economy fares at the time of final payment (a non-refundable fare policy is commonplace for airlines, although exceptions can be made depending on the type of fare chosen). In the event that AUQUI provides the flight reservations, all international and domestic quotes are subject to change until AUQUI has received final payment, and fare will be purchased in the name of the traveler. Flight confirmation is based on availability. Flight reservations cannot be confirmed until AUQUI receives copies of the passports of the client and accompanying travelers, together with the corresponding payment for the purchase. All air transportation providers are independent contractors and are not the property of, nor are administered, controlled or operated by AUQUI. Your airline ticket represents a contract between the client and the airline, even if and when the air fare was bought through AUQUI. Therefore, our company does not accept responsibility and shall not assume responsibility nor accept claims related to flight seat reassignments, changes of passengers’ name, flight scheduling changes or cancellations. In the event of any changes or cancellations related to air fare contracts or flight tickets, both before and after the beginning of the client’s trip, all airline prices fees or surcharges for flight changes or cancellations shall be applied. AUQUI is committed to assisting you in the entire flight process, whether you bought the tickets through AUQUI or not, while always striving to satisfy your requirements and looking to your convenience. AUQUI can purchase all the international and domestic flights that the client requires to carry out the trip. AUQUI will do everything possible to guarantee that the prices of flights shall be equal to those the client was originally quoted. However, airlines reserve the right to modify or remove fares without prior notice. In the event that the client does not deposit the indicated amount at the time of flight reservation, within the time period stipulated by AUQUI, the price of the fare could vary. The fare can only be guaranteed if and when the reservation has been paid for in full and ticket emission has taken place. Likewise, flight tickets are not transferable, but some airlines do permit this procedure following payment of a penalty fee, which can vary according to the airline, and which must be paid for by the client. Flight schedules offered by AUQUI in the itinerary are references and are subject to changes; established flight times are shown on the flight tickets. The client must carefully verify the information printed on the tickets, so as to avoid difficulties. AUQUI will inform the client as soon as possible in the event of any flight changes. Any flight change by the airline that implies additional costs shall be paid for by the client. Lack of capacity of some airplanes to take off or land under certain weather conditions. Likewise, AUQUI does not accept responsibility for a partial or total loss of activities and/or services due to the aforementioned events or delays. AUQUI is committed to safeguarding the interests of our clients, by searching for the best available flight options at the best prices, according to the program, and to ensuring our guests’ satisfaction. Any photographic image taken by AUQUI during the trip must have verbal or written approval by the client. In order for any photograph to be used for promotional or advertising purposes, written approval must be given by the client. With the acceptance of such terms and conditions the client accepts to being included in our database and to receiving our communications via social media, post-sales services and newsletter. The client can unsubscribe to these media when he/she chooses to do so. Would you be interested in obtaining a free professional photographic archive of your trip? Please ask your sales representative about this opportunity. Our prices do not include General Sales Tax (I.G.V. ), neither for hotels nor for services for clients who are residents in Peru, unless explicitly stated. The I.G.V. is a tax applied to Peruvian citizens as well as to residents in Peru. In accordance with Decree-Law No. 919, foreign nationals visiting Peru who present their passports, duly stamped by Peru’s Immigrations Service, or their Andean Immigration Card, will be exempt from the I.G.V. tax for lodging or meals services at hotels (breakfast, lunch and dinner). Tourists who remain for over 60 days in Peru, or those who do not present their passports with the indicated stamps, are subject to paying the I.G.V. for the aforementioned services. Due to these conditions, quoted prices could be increased. If and when the client disregards or fails to comply with the company’s Terms and Conditions as established in this document. When the behavior of a client puts at risk their own life and safety, or the lives and safety of others. When the security or quality of a trip is compromised by an accidental or unavoidable event. Upon the first two cases of contract rescission, the company offers no reimbursement; in a third case of contract rescission, it offers a partial reimbursement, in accordance with the expenses faced by the company and the policies of third-party providers, until the moment of contract rescission. Clients can dissolve the contract according to their own criteria. However, In the event of contract dissolution on the part of the client, any reimbursement shall be subject to the expenses that AUQUI would have incurred up to the moment of contract rescission, and to the policies of third-party providers. AUQUI reserves the right to rescind the contract in the event that the client has not informed the company about an addiction (alcohol, drugs or other) that could endanger or put at risk the lives or the wellbeing of the client or of others. AUQUI reserves the right, and will be able to rescind the contract in the event that any client motivates, proposes to commit, or commits any unlawful acts, felonies, crimes and/or misdemeanors. I have chosen a trip that is well adapted to my physical skills and health conditions. I have no physical condition, disability or special ability that implies or poses risks, or the possibility of endangering myself or others. I have a valid passport, and have all the visas, permits, certificates and vaccinations required to travel. I will read all the information provided, prior to the trip, regarding clothing, medical prerequisites and specific cultural protocols. I will make sure to communicate to the company about any condition or special requirement at least 30 days prior to travel. This includes medical or physical restrictions, diet, needs for special assistance, room preferences for lodging, or any other type of condition or requirement. I understand that AUQUI will do everything possible to satisfy special requests, but that the company cannot guarantee that such changes will be possible. I will respect the laws and social customs of the countries I visit. I will respect and follow environmental regulations during the trip, according to what is indicated by AUQUI’s guides or sales representatives. I will respect the rights and privacy of other trip participants. I understand that AUQUI reserves the right to suspend services during a trip to any person whose health or behavior could impair other persons’ or guests health, wellbeing or enjoyment. I understand that activities that take place in remote or not easily accessible locations imply that access to medical facilities or emergency evacuation services may be limited. I understand that situations can arise that could be beyond the control of AUQUI. I understand that travel implies different risks, and that scheduled activities could turn out not according to expectations, thereby accepting the situations and experiences that destiny may bring as learning experiences and opportunities for personal growth. I assume responsibility for taking all necessary measures in order to safeguard my personal health and physical integrity. AUQUI reserves the right to contract for objective reasons; that is, the company reserves the right to close a contract or not to, as well as the right to determine with whom a contract is signed, in accordance with Article No. 62 of Peruvian Political Constitution. AUQUI is a Cusco-based company, constituted and established in the city of Cusco, Peru. Therefore, any discrepancy related to the services rendered, or to the present document, shall be treated in accordance with Peruvian laws and shall be resolved in the courts of the city of Cusco. AUQUI reserves the right to correct any error or omission in its published materials, and to modify the extant Terms and Conditions at any time, as a result of substantial changes in legislation or regulations. Any changes or amendments of the Terms and Conditions will be validated upon publication by the media considered appropriate, and without having retroactive validity. The reading by the client of this document is considered obligatory prior to closing of the contract with the company. At the moment of confirming the final itinerary and completing the initial payment, the client declares his/her conformity and agreement to respect and comply with all of AUQUI’S Trip Terms and Conditions, as established in this document. We are very pleased to serve you. AUQUI will do everything possible to make your trip to the best destinations in Peru a truly unforgettable experience; one that is personally customized, problem-free, and of exceptionally high quality.